Have you ever heard the phrase “putting the cart before the horse”; or, how about “closing the gate after the horse has bolted”? Both of these phrases are saying basically the same thing, they are describing putting things in the wrong order. Another phrase meaning something similar is the phrase “turning things upside down”. This phrase is speaking of getting the obvious order of things confused and mixed up. Let’s take time to see how the people of Judah were “turning things upside down”…. 14) Therefore, behold, I will proceed to do a marvellous work among this people, [even] a marvellous work and a wonder: for the wisdom of their wise [men] shall perish, and the understanding of their prudent [men] shall be hid. 15) Woe unto them that seek deep to hide their counsel from the LORD, and their works are in the dark, and they say, Who seeth us? and who knoweth us? 16) Surely your turning of things upside down shall be esteemed as the potter’s clay: for shall the work say of him that made it, He made me not? or shall the thing framed say of him that framed it, He had no understanding? They were living pious, religious lives but did not love, nor reverence, God in their hearts (vs13). They thought they were hiding this from God and that they were wise in doing so (vs 14). Secretly, they lived in opposition to the desires of God for their lives (vs 15). The Lord is confronting them in verse 16, as He states that “Surely (truly), your turning things upside down…” In other words, He clearly declares they have taken that which was obvious and mixed it all up. It was obvious God knows all things, including the condition of their hearts. It was obvious the Lord did not desire outward, hypocritical obedience. It is obvious that they were exhibiting foolishness and a lack of knowledge of the True God. It was obvious that they were ignorant of all these truths. They were “turning things upside down”. Just like the people of Judah in the OT, the Pharisees of the NT times hypocritically served the Lord as well. (Matt 23:23-33, Matt 6:1-8). In today’s time there is no difference. We still have to be on the lookout that we are serving the Lord from a pure heart of love and submission to His will and ways. (Luke 10:25-28). This is the only way we can avoid following in the footsteps of the people of Judah and the Pharisees. shall be esteemed as the potter’s clay: for shall the work say of him that made it, He made me not? or shall the thing framed say of him that framed it, He had no understanding? What they were doing is much like a piece of potter’s clay complaining to the potter about how it was shaped and formed. Talk about being mixed up! What right does a lump of clay have to complain to its maker? Absolutely none! Isa 45:9-10 – Woe unto him that striveth with his Maker! [Let] the potsherd [strive] with the potsherds of the earth. Shall the clay say to him that fashioneth it, What makest thou? or thy work, He hath no hands? Woe unto him that saith unto [his] father, What begettest thou? or to the woman, What hast thou brought forth? Jer 18:1-10 – The word which came to Jeremiah from the LORD, saying, Arise, and go down to the potter’s house, and there I will cause thee to hear my words. Then I went down to the potter’s house, and, behold, he wrought a work on the wheels. And the vessel that he made of clay was marred in the hand of the potter: so he made it again another vessel, as seemed good to the potter to make [it]. Then the word of the LORD came to me, saying, O house of Israel, cannot I do with you as this potter? saith the LORD. Behold, as the clay [is] in the potter’s hand, so [are] ye in mine hand, O house of Israel. [At what] instant I shall speak concerning a nation, and concerning a kingdom, to pluck up, and to pull down, and to destroy [it]; If that nation, against whom I have pronounced, turn from their evil, I will repent of the evil that I thought to do unto them. And [at what] instant I shall speak concerning a nation, and concerning a kingdom, to build and to plant [it]; If it do evil in my sight, that it obey not my voice, then I will repent of the good, wherewith I said I would benefit them. Rom 9:19-21 – Thou wilt say then unto me, Why doth he yet find fault? For who hath resisted his will? Nay but, O man, who art thou that repliest against God? Shall the thing formed say to him that formed [it], Why hast thou made me thus? Hath not the potter power over the clay, of the same lump to make one vessel unto honour, and another unto dishonour? WHEN WE RECOGNIZE THE LORD IS OUR CREATOR, WE ARE RECOGNIZING WE ARE UNDER HIS AUTHORITY AND SOVEREIGN RULE OVER OUR LIVES. This is an extremely important principle… by recognizing His Creatorship we are automatically recognizing His authority over us! This is why Satan is trying for the world to accept the false teaching of evolution as truth. By our believing evolution, God’s position as Creator and, by implication, His authority over us is denied. 1Cor 6:19-20 – What? know ye not that your body is the temple of the Holy Ghost [which is] in you, which ye have of God, and ye are not your own? For ye are bought with a price: therefore glorify God in your body (given to us at our physical creation) , and in your spirit (purchased on the cross), which are God’s. Keep in mind, your physical existence is the result of our Lord’s work of creation (which was begun at conception in your mother’s womb). Because of this, you are under the authority of Almighty God. What is your first responsibility to please and serve Him? Recognizing the sin that is in your life is hateful to God. And then, based on a heart of sorrow, turn from your sins. Come before the Lord with a spirit of humility, knowing that you can do nothing to secure His forgiveness and deliverance form your sins. Come, knowing that He only can bring salvation to you. Trust in His work on the cross as the basis of your forgiveness and deliverance. Accept His forgiveness. Live your life for Him, realizing what great things He has done for you. (Mat 5:3-12) Blessed are the poor in spirit: for theirs is the kingdom of heaven. Blessed are they that mourn: for they shall be comforted. Blessed are the meek: for they shall inherit the earth. Blessed are they which do hunger and thirst after righteousness: for they shall be filled. Blessed are the merciful: for they shall obtain mercy. Blessed are the pure in heart: for they shall see God. Blessed are the peacemakers: for they shall be called the children of God. Blessed are they which are persecuted for righteousness’ sake: for theirs is the kingdom of heaven. Blessed are ye, when men shall revile you, and persecute you, and shall say all manner of evil against you falsely, for my sake. Rejoice, and be exceeding glad: for great is your reward in heaven: for so persecuted they the prophets which were before you. As we begin our devotions on the Beatitudes, let’s keep in mind the basic theme of our text, it is describing 9 different characteristics of people that are “blessed”. What do we mean by “blessed”? The Greek word for “blessed” is describing a person who has received God’s goodness which results in the recipient’s happiness. We should take a moment today to ask ourselves a question… Are we living a genuinely happy (blessed) life? If so, we should thank and praise our Lord for the many goodnesses He has given to us this day. If not, over the next few days of our devotions, let’s pay special attention to what the Word of God tells us about living a blessed life. The beginnings of a blessed life can only be found in the Lord Jesus Christ… it is only through Him that we can find true happiness and peace. (Mat 6:13) For thine is the kingdom, and the power, and the glory, forever. Amen. Our Lord is ETERNALLY the King of Kings, the All-powerful Lord over all, who deserves all of our praise and devotion. He always has been, and always will be, the unmatched God of all creation. His person, His work, and His Word will never change. Rejoice in Him knowing that we serve an unchanging Lord, who will always work for His glory (and our good) by being faithful to the promises of His Word. The Lord’s “glory” speaks of His person (who He is) and His reputation (His revelation of Himself). Our God stands out exceedingly far above all mankind. He is the Almighty, Creator, King and God of this Universe. He knows all things, is everywhere present and His perfectly sinless and just. He is our loving, heavenly, Father who has given His all for us. This is why He is worthy of all of our reverence, worship, obedience, and attention. He deserves to be at the very center of our lives. This is His “glory”. As we enter our day, let’s think about how His majesty and greatness. Let’s take a moment to dwell on who He is. February 25, 2012 7:02 am / 9 Comments on Are You An Encourager? Barnabas, the missionary companion of the Apostle Paul, is found mentioned throughout the pages of the New Testament Scripture. Although Barnabas is mentioned several times, little is known about this man and his service to his Lord and Savior Jesus Christ. Barnabas, and his service to Christ, are overlooked subjects lost within the pages of the Word. The name Barnabas means “son of prophecy”; “son of inspiration”; “son of consolation” or “son of encouragement”. This name for Barnabas was not his given name, it was applied to him later in life as a description of his life and ministry (Acts 4:36). Barnabas was a master at giving strength to those who were weary; he helped give hope to the hopeless and accompaniment to the lonely. Barnabas was, truly, an “encourager” above all fallen humans. The first mention of the events in Barnabas’s life is in found in Acts 4:32-37… here, we find the gifts of sympathy for others in need and a willingness to sacrifice himself for the welfare of others….. The another event in the life of Barnabas displays his willingness to accept those rejected by others. Also, he made honest, spiritual judgments not being influenced by the judgments made by others. Here, we find Barnabas willing to stand with the newly converted Saul of Tarsus. This same Saul was the one guilty of persecuting and murdering Christians in Jerusalem. Barnabas’ trust in Saul, and his conversion experience, can only be explained as a divine act of grace. He is described as a “good man” and “full of the Holy Ghost and faith”. In other words, an Godly encourager must be one that spent his life being beneficial to others; he allowed the Holy Spirit and trust in the Lord to control every aspect of his life. Also, as we see his actions with the Antioch Christians … he was sensitive to the workings of God in the lives of others, he was joyful to see God at work in their lives, and he called them to action by standing with them. Barnabas shows his humility by recognizing the need for Paul’s ministry at Antioch. There was no room for puffed up pride in his life. He recognized that, for the Antioch church’s good, Paul need to minister to them as well as he. Barnabas was used as a courier/representative by taking offerings from the church at Antioch and delivering it to the Judaean Christians. This showed his trustworthiness, and willingness to serve in any capacity where needed to help others. Acts 11:27-30 – And in these days came prophets from Jerusalem unto Antioch. And there stood up one of them named Agabus, and signified by the spirit that there should be great dearth throughout all the world: which came to pass in the days of Claudius Caesar. Then the disciples, every man according to his ability, determined to send relief unto the brethren which dwelt in Judaea: Which also they did, and sent it to the elders by the hands of Barnabas and Saul. Barnabas, along with Saul, was recognized as having the calling of God upon him. This calling of Barnabus, in context, was to a ministry of missions… however, this calling included the exercise of encouragement during the course of his missionary ministry. Also, please note that Barnabas was a willing servant of the Lord, willing to do whatever he was called to do. Here we find, perhaps the greatest exhibition of encouragement in the life of Barnabas. Previously, John Mark had accompanied Paul and Barnabas on their missionary journeys. John Mark, unexpectedly leaves them at Pamphylia. As time passes, John Mark desires to rejoin Paul and Barnabas as they begin another missionary journey. Paul is not willing to take John Mark for fear of him leaving the group again. Barnabas is willing to give John Mark a second chance at service to the Lord. Here, we see Barnabas exhibiting forgiveness, the willingness to give second chances, the recognition that no one is perfect, and the desire to accompany those struggling to serve the Lord. 2Tim 4:11 – Only Luke is with me. Take Mark, and bring him with thee: for he is profitable to me for the ministry. Encouragers are not always perfect… their ministry calls them to make judgments about others all the time. At times, they can make wrong judgments about those they are trying to help… in spite of their imperfections and misjudgments, they continue to serve the Lord and attempt to encourage those who are trying to serve God. In this case, Barnabas mistakenly encouraging Peter to bend his beliefs to please other men. In the context, there erupts a disagreement between Paul and Peter concerning the gospel going to the Gentiles. At one point, Peter joins with John and James in agreeing with Paul that the gospel should go to the Gentiles… based upon this belief, Peter began to associate freely with Gentiles. However, when Peter enters into the presence of other physical Jews who disagreed with his beliefs, he compromises his stand and separates himself from the Gentiles in an effort to please the Jews. This was a horrible display of hypocrisy. Unfortunately, Barnabas fell into the trap of compromise as well, following the example of Peter. In doing so, Barnabas wrongly encouraged Peter by following his lead. Here are a few more points about being encouragers …. Godly encouragers recognize the role of their life experiences in their ministry. They also recognize the importance of their ministry in the plan of God and the lives of God’s servants. Luke 22:31-33 – And the Lord said, Simon, Simon, behold, Satan hath desired [to have] you, that he may sift [you] as wheat: But I have prayed for thee, that thy faith fail not: and when thou art converted, strengthen thy brethren. And he said unto him, Lord, I am ready to go with thee, both into prison, and to death. Let us all be thankful to the Lord for the encouragers who have aided us throughout our lifetime of service to the Lord. Also, let us take seriously, the opportunities the Lord opens to us to be an encouragement to others. Let us always be watchful for those opportunities and be thankful when we are allowed to help others who are striving to serve the Lord. Do you find yourself in need of encouragement? Do you miss having someone who will always accompany and strengthen you throughout your walk on this earth? Then look to the Lord for the forgiveness of your sins and an everlasting presence in your life. I have a tab available on my blog that gives in depth information on what salvation is and what you must do to be saved. Please click on this link for more information about salvation. The Lord is all-powerful. The Greek word for “power” is the word from which we get “dynamite”. It describes the type of power that can accomplish any given task. No matter how great the need; no matter how difficult the situation; no matter how great the temptation… our Lord can intervene and graciously give us the victory. What a wonderful Lord we serve! Are you facing a trial that seems impossible to get through? Be patient and wait on Him. He will do what is for our good. When we are unable… He is always able! As fallen mankind, our lives are imprisoned by our own evil sinfulness much like an explorer is trapped and held by quicksand. We are facing eternal, spiritual death and cannot remove ourselves from this horrible situation. Our only hope of deliverance is found in the Lord. He is the One that can reach down and pull us out of sin’s punishment, power and even its very presence (in eternity). Let’s come before the Lord in a spirit of helplessness and submission, realizing, without His intervention in our lives, we are ensnared by our own sinful desires and awaiting eternal ruin. 20) When ye come together therefore into one place, [this] is not to eat the Lord’s supper. 21) For in eating every one taketh before [other] his own supper: and one is hungry, and another is drunken. 22) What? have ye not houses to eat and to drink in? or despise ye the church of God, and shame them that have not? What shall I say to you? shall I praise you in this? I praise [you] not. They could not have been meeting with the right motives in mind for the supper. Their actions clearly revealed this… each selfishly ate without consideration of the others. They brought their own suppers to church to eat in front of others. Some ate to fulfill their own fleshly desire of hunger, others drank to excess causing drunkeness. In both cases, this was selfish behavior not behavior that desires the Lord’s glory. 24) And when he had given thanks, he brake [it], and said, Take, eat: this is my body, which is broken for you: this do in remembrance of me. Paul’s instructions were based upon the example that Christ Himself set as He led the first observance of the Lord’s Supper. The bread is symbolic of the body of Christ (His sufferings on the cross). As we chew the bread it is a picture of Christ’s body being abused, torn and broken on our behalf. As we swallow the bread it is picturing that His work has been applied to us. vs 25 – To remember His shed blood for us. 25) After the same manner also [he took] the cup, when he had supped, saying, This cup is the new testament in my blood: this do ye, as oft as ye drink [it], in remembrance of me. The fruit of the vine is symbolic of His shed blood (His life given on the cross – the life of the flesh is in His blood). His shed blood is the basis of the convenant of salvation by grace that the Lord has given to us. As we pour the fruit of the vine from the cups to our lips it pictures the His blood being poured form His body. As we swallow the fruit of the vine, we are picturing His blood being applied to us. vs 26 – To remember His death and His second coming. 26) For as often as ye eat this bread, and drink this cup, ye do shew the Lord’s death till he come. Paul now summarizes what he has covered so far…. A combination of His body being abused, torn and broken along with His blood being shed is symbolic of the process of death that He went through on the cross. 27) Wherefore whosoever shall eat this bread, and drink [this] cup of the Lord, unworthily, shall be guilty of the body and blood of the Lord. 28) But let a man examine himself, and so let him eat of [that] bread, and drink of [that] cup. 29) For he that eateth and drinketh unworthily, eateth and drinketh damnation to himself, not discerning the Lord’s body. 30) For this cause many [are] weak and sickly among you, and many sleep. Paul gives ample warning about the need to take care in the partaking of the Lord’s Supper. To eat of it in an unworthy fashion is sinful and, therefore, makes one guilty of the body and blood of Christ. He suffered to pay the price for our sins. Some of those sins He died for were the sins of partaking of the Supper unworthily. How do we eat of it unworthily? 26) Jesus answered, He it is, to whom I shall give a sop, when I have dipped [it]. And when he had dipped the sop, he gave [it] to Judas Iscariot, [the son] of Simon. 27) And after the sop Satan entered into him. Then said Jesus unto him, That thou doest, do quickly. 28) Now no man at the table knew for what intent he spake this unto him. 29) For some [of them] thought, because Judas had the bag, that Jesus had said unto him, Buy [those things] that we have need of against the feast; or, that he should give something to the poor. 30) He then having received the sop went immediately out: and it was night. Therefore, we are to take time to give all opportunity to examine ourselves to be sure we have right motives and desires in the supper and that we have no unconfessed sin in our lives. By partaking of the supper unworthily, we are harming ourselves and may face sickness or even death. This is a big deal, no small issue. 31) For if we would judge ourselves, we should not be judged. 32) But when we are judged, we are chastened of the Lord, that we should not be condemned with the world. How do we avoid this type of judgment, by taking the time to judge ourselves and take care of our known sins, our desires and intentions in observing the supper. 33) Wherefore, my brethren, when ye come together to eat, tarry one for another. 34) And if any man hunger, let him eat at home; that ye come not together unto condemnation. And the rest will I set in order when I come. Therefore, we are to make sure we give all the needed time to examine our lives and to prepare our hearts properly for the supper. No selfishness by hurrying the self examination or fulfilling hunger. 1 Cor 11: 23 – 24) For I have received of the Lord that which also I delivered unto you, That the Lord Jesus the [same] night in which he was betrayed took bread: And when he had given thanks, he brake [it], and said, Take, eat: this is my body, which is broken for you: this do in remembrance of me. 1 Cor 11: 25) After the same manner also [he took] the cup, when he had supped, saying, This cup is the new testament in my blood: this do ye, as oft as ye drink [it], in remembrance of me. Matt 26: 29) But I say unto you, I will not drink henceforth of this fruit of the vine, until that day when I drink it new with you in my Father’s kingdom. 1 Cor 11:26) For as often as ye eat this bread, and drink this cup, ye do shew the Lord’s death till he come. Matt 26: 30) And when they had sung an hymn, they went out into the mount of Olives. The Lord is watching over us and protecting us from Satan and His temptations. Let’s thank Him today for His protecting hand upon us! 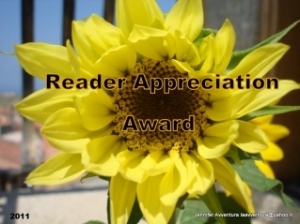 Reader Appreciation Award – I Thank the Lord for You! February 19, 2012 2:36 pm / 2 Comments on Reader Appreciation Award – I Thank the Lord for You! I was nominated for this award by Angela at http://meetingintheclouds.wordpress.com/. Angela’s blog has been a constant source of encouragement to me. Angela is a wonderful lady whose blog glorifies and honors her Lord. She consistantly honors the Lord by presenting both doctrinal and practical truths for us to live by. I thank the Lord for her faithfulness and His workings in her life. 1. Award your top 6 bloggers who have commented the most. 3. You cannot award someone who has already been awarded. You cannot give the award back to me. I thank the Lord for the following bloggers who have so faithfully commented on Settled In Heaven Blog…. they are my recipients for this award. Let me mention Angela at http://meetingintheclouds.wordpress.com/ , who has already recieved this award and was the blogger with the greatest number of comments on my blog..
To each of the above… let me say “thank you”! Your comments and suggestions have been a tremendous asset to Settled In Heaven… May the Lord continue to bless each and every one of you! Our willingness to forgive the debts of others is an indication of the Lord’s forgiveness of our sin. After all, if the great debt of our sin has been forgiven by God… how easy it is to forgive the small debts owed to us by others. Have we ever experienced God’s gracious forgiveness? If so, forgive those who are indebted to us. It is one of the greatest ways we can display Christ and His love to those around us. February 18, 2012 4:22 pm / 5 Comments on Who Is Your Friend? “A true friend is worth their weight in gold”, this saying is forever true, no matter how high the price of gold may rise. A true friend can be counted upon to always keep our confidences, give sound advice, always be there to help in time of need, the list goes on and on. “Two [are] better than one; … For if they fall, the one will lift up his fellow: but woe to him [that is] alone when he falleth; for [he hath] not another to help him up. … And if one prevail against him, two shall withstand him; and a threefold cord is not quickly broken. In Christ, we find a perfect friend. Why is Christ the perfect friend for us? Let’s take time to study what the Word of God teaches us about being friends with the very Son of God. 13) Neither is there any creature that is not manifest in his sight: but all things [are] naked and opened unto the eyes of him with whom we have to do. 14) Seeing then that we have a great high priest, that is passed into the heavens, Jesus the Son of God, let us hold fast [our] profession. 15) For we have not an high priest which cannot be touched with the feeling of our infirmities; but was in all points tempted like as [we are, yet] without sin. 16) Let us therefore come boldly unto the throne of grace, that we may obtain mercy, and find grace to help in time of need. Why is Christ the perfect friend for us? The Word of God gives us the answer to this question in Hebrews 4:13-16 – In this text, we find 4 reasons why we can rely on Christ to meet our every need when we look to Him as our friend. Seeing then that we have a great high priest, that is passed into the heavens, Jesus the Son of God, let us hold fast [our] profession. Sinful mankind cannot stand in the presence of a Holy God. This is why Christ’s intercession on our behalf is an absolute necessity. Reason #3 – He knows what we are going through..
For we have not an high priest which cannot be touched with the feeling of our infirmities; but was in all points tempted like as [we are, yet] without sin. Christ, who is God Himself, was born into the earth as the Incarnate God. He did this not only to die for our sins, but also, so that He could share in the experiences of this world. He faced temptation (Luke 22:28), disappointment and sorrow (Matt 23:37), loss (John 11:35), hunger (Mark 1:12-13), loneliness (Mark 14:34-40)… the entire human experience. He even knew the feeling of guilt as He bore our sins upon Himself. This knowledge of our experiences makes Him the perfect One to run to for comfort and encouragement in times of great distress. 6) So that we may boldly say, The Lord [is] my helper, and I will not fear what man shall do unto me. Oh, what a friend Christ is! We are a needy people. We need our spiritual bread (an understanding of His Word) supplied to us every day. Because we possess a physical body, we need our daily physical bread (food, clothing and shelter) provided to us as well. As we enjoy, and benefit, from the daily blessings… Do we recognize they come from our Lord? Do we partake of them with thankful hearts? By taking the time to request these blessings from Him, we are showing a recognition of our need, an understanding of His grace and appreciation for His divine supplies. (Mat 6:10) Thy will be done in earth, as it is in heaven. God’s will is perfectly fulfilled in heaven. What a different world this would be if we all flawlessly obeyed His will on earth! No more murder, no more thefts, no lying nor deceit, the list goes on and on. Let’s all pray that His will be done here on earth…. beginning with our own life. Spirits Among Us – What Are They? February 15, 2012 5:44 pm / 6 Comments on Spirits Among Us – What Are They? With the existence of ghosts a major subject in today’s entertainment world, I thought it would be good to look at the truth about ghosts. The Word of God is the final authority on all issues of life here on earth and in the spirit world. Let’s take some time to examine the truth about ghosts. In part #1 of our study we have seen that the Bible clearly tells us that the spirits of those who have died DO NOT return to earth and live among us. If this is the case, does this mean that the only living beings on earth are human, embodied beings? Absolutely not! The Word of God tells us that there is a spirit realm that does exist on earth. This spirit realm includes Satan and others who oppose the things of God. Also, there are angels that exist to aid and protect God’s people. First let’s look at those spirit beings that oppose the cause of Christ…. (Eph 6:10-12) – Finally, my brethren, be strong in the Lord, and in the power of his might. Put on the whole armour of God, that ye may be able to stand against the wiles of the devil. For we wrestle not against flesh and blood, but against principalities, against powers, against the rulers of the darkness of this world, against spiritual wickedness in high places. (Rom 8:38) – For I am persuaded, that neither death, nor life, nor angels, nor principalities, nor powers, nor things present, nor things to come, Nor height, nor depth, nor any other creature, shall be able to separate us from the love of God, which is in Christ Jesus our Lord. (2Co 4:3-4) – But if our gospel be hid, it is hid to them that are lost: In whom the god of this world hath blinded the minds of them which believe not, lest the light of the glorious gospel of Christ, who is the image of God, should shine unto them. (Act 26:17-18) – Delivering thee from the people, and from the Gentiles, unto whom now I send thee, To open their eyes, and to turn them from darkness to light, and from the power of Satan unto God, that they may receive forgiveness of sins, and inheritance among them which are sanctified by faith that is in me. (Job 1:7) – And the LORD said unto Satan, Whence comest thou? Then Satan answered the LORD, and said, From going to and fro in the earth, and from walking up and down in it. As we can see, it is obvious that Satan and other fallen angels are present among us seeking to hinder the Christian’s walk with Christ and keep blinded the eyes of the lost world. (Heb 1:13-14) – But to which of the angels said he at any time, Sit on my right hand, until I make thine enemies thy footstool? Are they not all ministering spirits, sent forth to minister for them who shall be heirs of salvation? (Job 4:15-21) Then a spirit passed before my face; the hair of my flesh stood up: It stood still, but I could not discern the form thereof: an image was before mine eyes, there was silence, and I heard a voice, saying, Shall mortal man be more just than God? shall a man be more pure than his maker? Behold, he put no trust in his servants; and his angels he charged with folly: How much less in them that dwell in houses of clay, whose foundation is in the dust, which are crushed before the moth? They are destroyed from morning to evening: they perish for ever without any regarding it. Doth not their excellency which is in them go away? they die, even without wisdom. Based on the above we can see that elect and fallen angels (including Satan himself) are spirits that are present on the earth with us. The existence and ministry of these beings explain many of the references to “angels”, “spirits”, “ghosts” and “demons” that we find in the Bible…. (Mat 14:24-27) – But the ship was now in the midst of the sea, tossed with waves: for the wind was contrary. And in the fourth watch of the night Jesus went unto them, walking on the sea. And when the disciples saw him walking on the sea, they were troubled, saying, It is a spirit; and they cried out for fear. But straightway Jesus spake unto them, saying, Be of good cheer; it is I; be not afraid. (Luk 24:36-40) – And as they thus spake, Jesus himself stood in the midst of them, and saith unto them, Peace be unto you. But they were terrified and affrighted, and supposed that they had seen a spirit. And he said unto them, Why are ye troubled? and why do thoughts arise in your hearts? Behold my hands and my feet, that it is I myself: handle me, and see; for a spirit hath not flesh and bones, as ye see me have. And when he had thus spoken, he shewed them his hands and his feet. (Mat 10:1) – And when he had called unto him his twelve disciples, he gave them power against unclean spirits, to cast them out, and to heal all manner of sickness and all manner of disease. (Mar 1:23-27) – And there was in their synagogue a man with an unclean spirit; and he cried out, Saying, Let us alone; what have we to do with thee, thou Jesus of Nazareth? art thou come to destroy us? I know thee who thou art, the Holy One of God. And Jesus rebuked him, saying, Hold thy peace, and come out of him. And when the unclean spirit had torn him, and cried with a loud voice, he came out of him. And they were all amazed, insomuch that they questioned among themselves, saying, What thing is this? what new doctrine is this? for with authority commandeth he even the unclean spirits, and they do obey him. (1Sa 28:11-20) – Then said the woman, Whom shall I bring up unto thee? And he said, Bring me up Samuel. And when the woman saw Samuel, she cried with a loud voice: and the woman spake to Saul, saying, Why hast thou deceived me? for thou art Saul. And the king said unto her, Be not afraid: for what sawest thou? And the woman said unto Saul, I saw gods ascending out of the earth. And he said unto her, What form is he of? And she said, An old man cometh up; and he is covered with a mantle. And Saul perceived that it was Samuel, and he stooped with his face to the ground, and bowed himself. And Samuel said to Saul, Why hast thou disquieted me, to bring me up? And Saul answered, I am sore distressed; for the Philistines make war against me, and God is departed from me, and answereth me no more, neither by prophets, nor by dreams: therefore I have called thee, that thou mayest make known unto me what I shall do. Then said Samuel, Wherefore then dost thou ask of me, seeing the LORD is departed from thee, and is become thine enemy? And the LORD hath done to him, as he spake by me: for the LORD hath rent the kingdom out of thine hand, and given it to thy neighbour, even to David: Because thou obeyedst not the voice of the LORD, nor executedst his fierce wrath upon Amalek, therefore hath the LORD done this thing unto thee this day. Moreover the LORD will also deliver Israel with thee into the hand of the Philistines: and to morrow shalt thou and thy sons be with me: the LORD also shall deliver the host of Israel into the hand of the Philistines. Then Saul fell straightway all along on the earth, and was sore afraid, because of the words of Samuel: and there was no strength in him; for he had eaten no bread all the day, nor all the night. Did Saul actually see Samuel or a demon masquerading as Samuel? To answer this question we should turn to …. (2Co 11:13-15) – For such are false apostles, deceitful workers, transforming themselves into the apostles of Christ. And no marvel; for Satan himself is transformed into an angel of light. Therefore it is no great thing if his ministers also be transformed as the ministers of righteousness; whose end shall be according to their works. (Mat 17:1-9) – And after six days Jesus taketh Peter, James, and John his brother, and bringeth them up into an high mountain apart, And was transfigured before them: and his face did shine as the sun, and his raiment was white as the light. And, behold, there appeared unto them Moses and Elias talking with him. Then answered Peter, and said unto Jesus, Lord, it is good for us to be here: if thou wilt, let us make here three tabernacles; one for thee, and one for Moses, and one for Elias. While he yet spake, behold, a bright cloud overshadowed them: and behold a voice out of the cloud, which said, This is my beloved Son, in whom I am well pleased; hear ye him. And when the disciples heard it, they fell on their face, and were sore afraid. And Jesus came and touched them, and said, Arise, and be not afraid. And when they had lifted up their eyes, they saw no man, save Jesus only. And as they came down from the mountain, Jesus charged them, saying, Tell the vision to no man, until the Son of man be risen again from the dead. 3. a glimpse into what eternity will be like for all who have trusted in Christ. There are spiritual powers that exist in this world that incredibly dangerous to man. To dabble in the spirit realm through channelers, Ouija boards, Satanism, Spiritism etc. is incredibly dangerous for Christian and non-Christian alike. (Mat 6:10) Thy kingdom come. Do we desire for God’s kingdom to come? If so, we are telling Him that we are willing to submit to His will and desires for our life. We are saying, Lord, I desire for you to be the King of my life and reign in the world around me. Are we willing to follow His leadership, as the Lord speaks to us through His Word? (Mat 6:9c) Hallowed be thy name. The term “hallowed” refers to “one that is set apart from all others”. Jesus is stating that the “name” of our Heavenly Father is so pure, and special, it is set apart from all others. The name “Heavenly” reveals to us that He finds His origin in heaven. He is not of this earthly, sinful world. His existence is that of eternal perfection far above all mankind. The name “Father” teaches us that He is the Beginning (Creator) of all. Also, it helps us to understand that God possesses a love for all which is demonstrated by His care of all creation. This is in addition to His greater redeeming love He holds towards those he has chosen to save. Today, let’s praise our Lord for being who He is … our perfect loving Creator who reigns from the heavens! (Mat 6:9b) Our Father which art in heaven…. Remember, when we pray, as Christians, we pray to our Heavenly Father who loves and genuinely works on our behalf AT ALL TIMES…. He will always give us what is best for us. If the request is not received, it is only because it would harm us. If the request is postponed, it is being delayed for our benefit. As we pray, let’s always remember we are praying to One who has a perfect love for us… we can rest knowing He is in control, He knows what is best for us, and He will always bring it to pass. As our Lord begins to instruct us on the content of our prayers, He makes it certain we understand that His instructions are not to be repeated word for word in a vain routine. The Greek word for “manner” puts forth the idea of “following this pattern” or “in this fashion”. As we enter into our day and come before Him in prayer, let’s always keep in mind that our prayers should be sincere and personal, flowing from our hearts in an individualized fashion.